They held a wedding and nobody died! And third time’s the charm for Margaery, her marriage to Tommen is consummated. I had somuch secondhand embarrassment watching that scene. But after stalling out a few times Margarey’s finally one step closer to getting whatever it is she wants. I really have no idea what her motivations are beyond ooooh, power…what does she want to DO with that power? But whatever it is I want her to get it. Girl has put up with a lot and she’s still scheming and throwing zingers! As Margarery is on the rise, Cersei is being pushed out. And like Scar (Cersei is so very Scar) she is clawing her way through the crowd, eating her own soul in desperation to retain her crown. First she swallows her tongue trying not to scream at Tommen’s suggestion she go on home now that he’s a married man. Then she bites through her lips to keep from clawing Margaery’s eyes out as she asks just what Cersei’s title — which in Cerseiland is her whole identity — even stands for now. Finally she allies herself with the hyenas (seriously, she is Scar), poor, hungry, dirty and deranged. Sansa’s first reaction to the proposal is, reasonably, Oh Hells No. I like best her threat to starve herself. 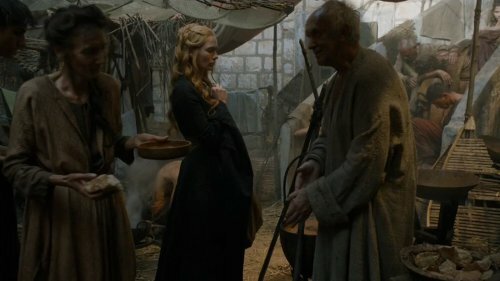 In the context of this particular episode it feels religious and I can get behind Saint Sansa. Anyway, Petyr gives her a pep talk that is basically “What if you agreed to marry and then destroyed them all exactly the way they did your family?” And my only question here is whyever would Rooseagree to this? He does balk a bit later, and accuse Littlefinger of playing all sides, so I guess he’s not a complete dunce. 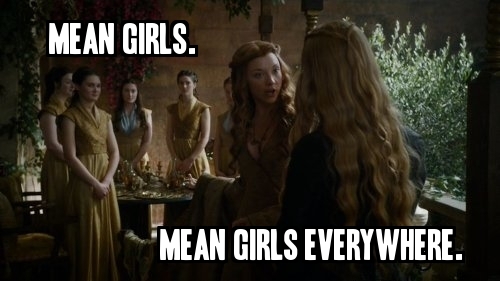 And I suppose good old sexism — Sansa Stark is a pretty little pawn, nothing more — works in her favor. At any rate Sansa is now in position to do a lot of damage, metaphorically and literally, and it is equal parts scary and exciting, especially as it doesn’t go this way in the books, so anything can happen! Brienne and Podrick have followed Team Sansa to her castle and I feel better about Sansa’s safety knowing Brienne is watching. In my heart of hearts I want an end-of-Camelot scenario where Brienne is Lancelot storming the gates to save her Lady Guinevere. I don’t think this is so farfetched what with Sansa surrounded by the Worst House in Westeros (and that’s a contest!) and Brienne offering to train Pod to be a knight. Thematic imagery I see you. 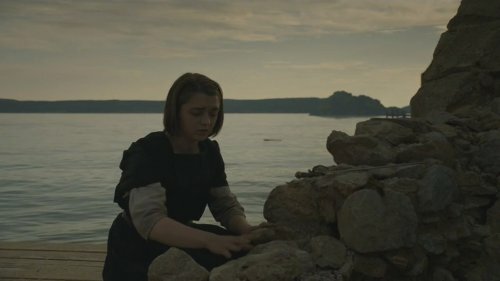 The North Remembers but in the deep south Arya is being made to forget. As part of her initiation into Faceless Assassin Club (Don’t talk about Faceless Assassin Club!) she must throw away all her possessions. Her clothes, Wolf-emblazoned bag, and the coin that got her through the doors of Faceless Assassin Club (Don’t talk about Faceless Assassin Club!) go into the sea. But she can’t bring herself to drop Needle into the depths, thank the Seven Gods or the Old Gods or the Red God or I guess most appropriately here, the Faceless God. (This episode has a lot of religious undertones which must mean something but I’m not sure what). Anyway, she buries Needle in a cairn of rocks just in case the dwarf king lets a dragon loose on her village (it’s kind of amazing how well that Hobbit analogy works here). Tyrion left his box AVA (against Varys advice) and went to a brothel because Tyrion loves brothels almost as much as the show loves to have scenes in brothels. On the way he sees a red priestess, because this episode is dripping with religion, and she maybe recognizes him. But that doesn’t stop him from practically introducing himself by name to the whore he chooses and then refuses because …he feels bad about strangling Shae? Or he’s been doing nothing but drink for a month. 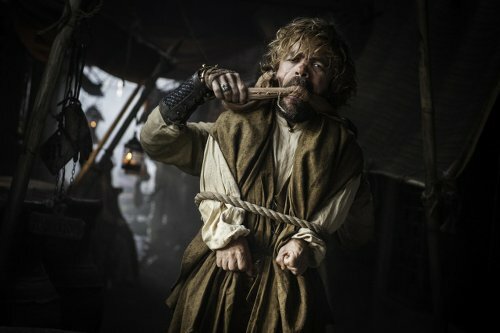 Whatever the reason Tyrion is off his game. Or he has a death wish. I mean, I’d be tired of Varys the nanny, too, but blurting out that he “always pays his debts” is asking for trouble. 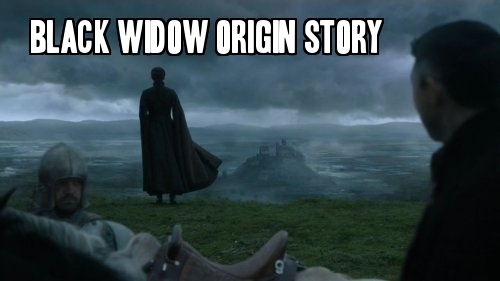 Which comes in the form of another down and out exile trying to drown his sorrows in drink and women but he can’t escape himself: Ser Jorah creeps up behind Tyrion and snatches him with a promise to bring him to the Queen. I’d say we’re meant to think Jorah the traitor plans to deliver Tyrion to his Sweet Sister but if we thought that we wouldn’t be paying attention. For one, Jorah has spent his entire time on the series being Dany’s puppy, even when he was betraying her he followed her around with stars in his eyes. The Lannisters are the reason he lost her favor, he’d want to betray them, not help them. But ignoring characterization entirely, they made a point of first calling out Cersei’s shaky status as Queen — if anything she’s A Queen, not The Queen — and then inserting a fake Daenerys, who is explicitly called The Queen, into the scene immediately preceding Jorah’s line. And just the sight of her gives him Angst so yes, he is still Dany’s knight.